To say that we’ve been keeping our eye on the Barbara Kean character as of late is an understatement. It’s kind of funny, because none of us dreamed that the woman we assumed would go on to marry Jim Gordon when this series began would one day (likely) morph into an icon like Harley Quinn. But such is the strange beast that is Gotham. If you’ve just arrived at the dance, allow us to catch you up. You see, earlier this year, it was teased that the Clown Princess of Crime would be showing up in some fashion in episode 22, which, as you may know, just so happens to be the season finale. 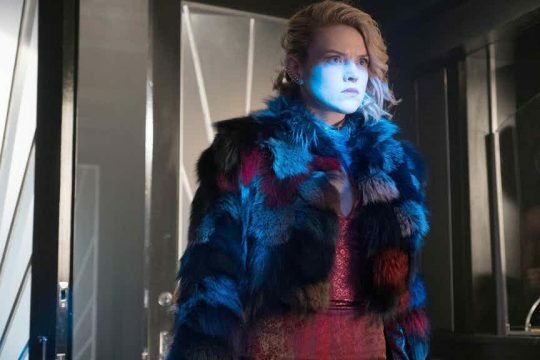 Connecting the dots to Barbara wasn’t hard to do when actress Erin Richards herself has gone on record saying that she’s actually had conversations with the show’s creative minds about transitioning to the Harley persona. “Absolutely. I think it’s sort of the next natural progression for her. We may or may not see something like that happening in the final episode [of the season]. Now, the latest exhibit comes in the form of an official image promoting May 8’s episode, “Heroes Rise: The Primal Riddle.” In it, we see Barbara sporting a highly familiar color scheme, which, as you can imagine, gives the fanbase even more to discuss before Gotham‘s season finale airs on June 5. Take a look at it below and as always, feel free to share your comments in the usual place.